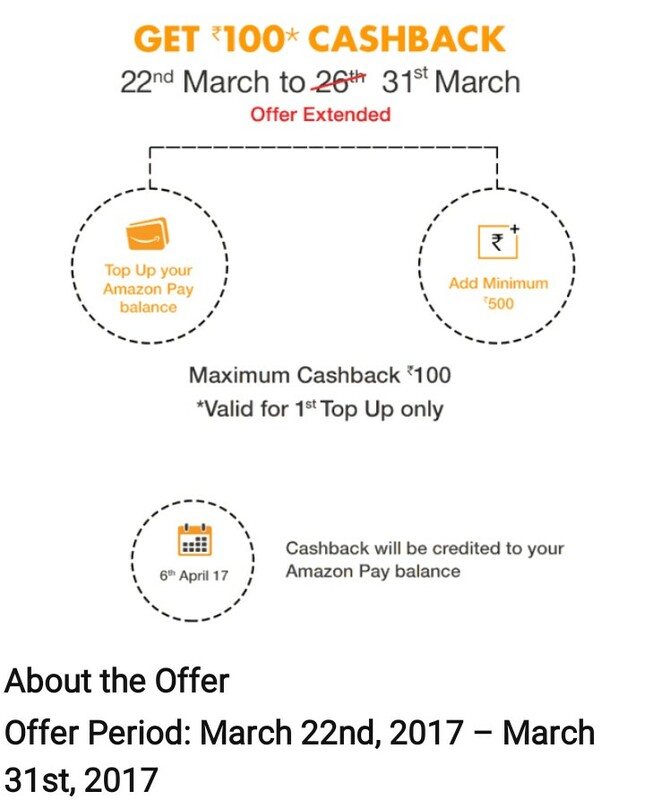 Amazon has came up with a offer for its users who have not yet done transaction with amazon pay balance. According to the offer source the offer limit was till 26th march But now it has extended to 31st march. 2) Login and Signup to your account and select pay balance option available on Amazon. 3) Add money to amazon pay balance using suitable payment option available on Amazon. 4) On addition of money rs 100 cashback will be credited back to your account within 24 hours..
Click here to visit the offer source of amazon. 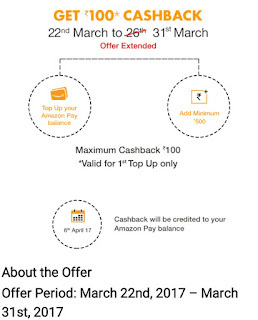 1) Add/load Rs 500 or more to your Amazon Pay balance and get 10% cashback as Amazon Pay balance (“Offer”). 3) Only the first load of Rs 500 to Amazon Pay Balance per customer in the Offer Period is eligible for the Offer. 4) The cashback amount is limited to maximum amount of Rs 100 per customer. 5) The customer will receive the cashback amount in the form of Amazon Pay balance, which will be credited to their account on www.amazon.in by March 31st, 2017.